Each of the survivors remembers with clarity his own part of this affair, but few know all the facts. The account which follows is based on the account by Martin Weeden in his book "Guest of the Emperor". The newspaper account of the War Crimes trials of the Japanese responsible; extracts from the log book of "USS Grouper" which torpedoed the "Lisbon Maru"; newspaper accounts of the presentation to the Sing pan Islanders who helped the survivors; The newspaper accounts of the "Japan Times Weekly" dated 20th October 1942; "The Knight of Bushido" by Lord Russell of Liverpool; personal accounts written at the time; and personal reminiscences. One matter should be placed beyond doubt. The official Japanese account quoted the survivors as voicing indignation against the American submarine which sank the "Lisbon Maru". This is quite untrue. The "Lisbon Maru" was armed, and carried Japanese troops as well as Prisoners of War. She bore no sign that she was a P.O.W. Ship. The American submarine was fully justified in sinking her, and I have never heard any criticism of the Americans for their action. "You are going to be taken away from Hong Kong" he said, "to a beautiful country where you will be well looked after, and well treated. I shall be in charge of the party. Take care of your health. Remember my face". Reactions among the P.O.W. 's were mixed. After the initial shock of the surrender on Christmas Day 1941 had been absorbed, hopes had run high for an early release. But now it had become apparent that no relief was to be expected from the Chinese Army. Singapore and the Philippines had fallen to the Japanese, and the news from the European theatre was bad. Conditions in the main camp in Shamshuipo, and the officers camp in Argyle Street were poor. Quarters were crowded, with inadequate food. Medical supplies were scarce. A diphtheria epidemic had reached alarming proportions. Deaths were common. A few intrepid men had escaped, but reprisals on those that remained were so severe, and the punishment of those who were caught was so savage that future escapes were doubtful, even for those who still retained sufficient stamina to make an attempt. There were some who argued that a move to Japan, which seemed the obvious destination, would be an improvement since (they believed) the Japanese Army would not wish to display in its own home land it's inhumanity to it's P.O.W. 's, and that consequently better treatment might be expected. The more cynical scouted these ideas and would have preferred to stay in Hong Kong where, perhaps, the chances of rescue and escape were slightly greater. But discussion was futile, for a POW. has no choice of action. On Board the "Lisbon Maru"
The men were divided into groups of 50, each group being in the charge of a subaltern, while the whole party was commanded by Lieutenant-Colonel H.W.M. (Monkey) Stewart, O.B.E., M.C., the Commanding Officer of the 1st Battalion of the Middlesex Regiment (The Diehards), assisted by a small number of officers. After an exhaustive but (as it turned out) ineffective medical examination, the prisoners were loaded on 27th September into lighters from the pier at the corner of Shamshuipo camp, and taken out to a freighter of some 7000 tons, the "Lisbon Maru", under the command of Captain Kyoda Shigaru, where they were accommodated in three holds. In No 1 hold, nearest the bows, were the Royal Navy under the command of Lt J.T. Pollock. In No 2 hold, just in front of the bridge, were the 2nd Battalion of the Royal Scots, 1st Battalion Middlesex Regiment, and some smaller units, all under Lieutenant-Colonel Stewart. And in No 3 hold, just behind the bridge, were the Royal Artillery under Major Pitt. Conditions were very crowded indeed, all men lying shoulder to shoulder on the floor of the hold, or on platforms erected at various heights. The officers on a small tween-deck half way up the hold were similarly crowded. There was not sufficient room for the men to be able to lie down all at the same time so sleeping was to be achieved by rota. Food was adequate according to prisoner of war status, the usual rice and tea for breakfast with an evening meal of rice and possibly a small portion of corned beef with a spoonful of vegetables. Drinking water was at a premium so was therefore rationed, water for washing was none existent. Some cigarettes were issued, a great luxury. The latrines consisted of wooden hutches hanging over the side, too few for the numbers on board. Within a very short time after boarding, the stench of sweating men and excreta became an intolerable burden, so the Japanese allowed sections of prisoners on deck in rota for prescribed periods of time. Also on board were 778 Japanese soldiers, who occupied most of the deck space forward, with a guard of 25 under Lt Hideo Wada. For the first few days, the voyage had so far been uneventful apart from the natural grumbling of the men, who so far had not been able to have much sleep, due to the heat, the oppressive atmosphere, the stench and the rolling movements of the ship. About half the men were issued with kapok life belts. At the subsequent War Crimes trial interpreter Niimori claimed that every man had a life belt, which he checked at each roll call. The ship sailed on 27th September. There were four lifeboats and six life rafts, and according to the Captain it was decided that the four lifeboats and four of the rafts should be set aside for the Japanese if required, leaving the remaining two life rafts for the 1800 + P.O.W.s. On the night of 30th September 1942, the U.S.S. "Grouper" (SS 214) of the 81 st division of the U.S. Pacific Fleet Submarine Force, was engaged in its second War Patrol in an area to the South of Shanghai. It was a bright moonlight night, and about 04:00 "Grouper" sighted about nine Sampans and a 7000 ton freighter, the "Lisbon Maru". Her C.O decided that it was too bright for a surface attack, so he paced the target in order to determine her speed and course. "Grouper" then took up station ahead of the "Lisbon Maru" waiting for daylight. During the course of this action "Grouper" passed within 4000 yards of two fishing vessels which were well lit. In No 2 hold Lieut. G.D. Fairbairn of the Royal Scots, duty officer for the day, visited the lower deck at 06:30 to rouse the men and ensure they rolled up their bedding and dressed for roll call at 07:00. As usual several men visited the scarce latrines on deck to beat the morning rush. At daylight, the "Lisbon Maru" altered course about 500. The "Grouper" was surprised, and so dived to start her under water attack. At 07:04 "Grouper" fired three torpedoes at 3200 yards, her closest working range. None of which hit. The "Lisbon Maru" stayed on course, "Grouper" fired a fourth, and two minutes ten seconds later heard a loud explosion. "Grouper" came up to periscope depth and saw that the "Lisbon Maru" had veered about 500 to starboard and stopped. "Grouper" then lined up abeam to starboard of the "Maru" for a bow shot. "Grouper's Commander recorded "Target meanwhile hoisted flag resembling 'Baker', and was firing at us with what sounded like small-caliber gun. Sharp explosions all round us". The account in the Japanese Times Weekly dated 20th October 1942 was different: "We must rescue the British P.O.W. 's was the foremost thought which leaped to our minds when the ship met the disaster", said Lt Hideo Wada. "It was just the hour for the roll call of prisoners; somewhat taken aback they were about to stampede. 'Don't worry, Japanese planes and warships will come to your rescue" we told them. The commotion died down. "It was encouraging to note that they had come to have such trust in the Imperial Forces during their brief P.O.W. camp life"
The P.O.Ws. did not record this torpedo hitting, it may have been mixed in with the depth charges exploding nearby. The Japanese claimed to have destroyed this sixth torpedo. "It was just about 10:30 that I happened to discover the sixth torpedo rushing towards our vessel", said one of the "Maru's" gunners. "Corporal Moji gave us the order to fire at the torpedo... Surprised beyond words, but faithful to the order, we charged our cannon with a shell, aimed at the torpedo, and fired. We then looked ahead and discovered that we had scored a direct hit". "Grouper" came up to periscope depth, the ship had disappeared, but the plane was still in sight, leaving the Commander assuming he had done the job. No one was allowed on deck for any reason and for the next seven hours in the stifling heat the Japanese were un-cooperative. Food and water were refused, as well as requests to visit the latrines. "Grouper" stayed in the vicinity all day, occasionally hearing depth charges, as did the P.O.Ws. At 19:05 visibility was poor and "Grouper" surfaced and left the area. It was about this time the Japanese began to batten down the hatches. Lt Colonel Stewart the senior British officer on board began to remonstrate with the Japanese, requesting that they should at least leave one balk of timber to help provide a little air. Captain Shigeru was arguing with Lt. Wada about the hatches being closed, but Wada insisted that his 25 guards could not control the 1800 + P.O.Ws. under the circumstances. At about 21:00 Lt.Wada came to the bridge and ordered Captain Shigeru to close the hatches completely. Wada was very threatening, telling Captain Shigeru he had no authority to interfere in military matters. All the hatches were battened down and covered with tarpaulins, which were then roped down leaving the P.O.Ws in complete darkness. At his trial in Hong Kong in October 1946 the Captain Kyoda Shigeru, the master of the "Lisbon Maru" stated that the Japanese destroyer "Kure" arrived on the scene in the afternoon of the 1st October, ordering the transfer of all 778 Japanese troops to the destroyer at 17:00. While this transfer was taking place using two of the lifeboats, the "Toyokuni Maru" under Captain Yano arrived. 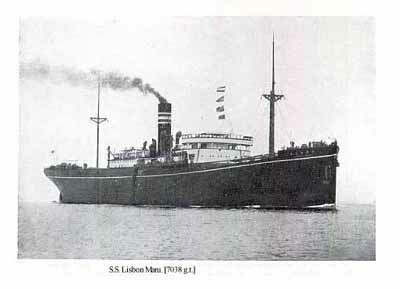 A conference was held onboard the "Lisbon Maru", and the remaining troops were transferred to the "Toyokuni Maru". The 25 guards along with the 77 crew remained onboard, with arrangements for the "Lisbon Maru" to be towed to shallow waters. There was now no means of exit and no fresh air flow, the conditions worsened very rapidly, but through it all the men remained calm and obedient. They had not had any food for over 24 hours. Apart from the few early birds who went at 06:30 prior to the torpedo attack they had been denied access to the latrines for over 24 hours as well. The men in number 2 hold managed to get into contact with RN men in number one hold by tapping out in code on the bulkhead, and number three hold by voice via a vent. They learned that conditions in number one were similar to their own, while those in number three were getting desperate. CQMS. Henderson of the Royal Scots, his beard jutting out aggressively, encouraged non-swimmers like himself by insisting that now was their opportunity to learn! Number three hold was now taking water and the pumps had to be manned, reports came from number three to Colonel Stewart in number two, that the men who were manning the pumps rapidly lost consciousness owing to the extreme heat and lack of air. Each man would do about six strokes on the pump before fainting. In number two hold, in similar conditions, they found that by lying flat and not moving they remained conscious. Reports came through that two men had died in number one hold from diphtheria. By dawn of the 2nd October, twenty four hours after the torpedo had struck, the air in the holds was becoming dangerously foul, the ship began to lurch and stagger, it was evident that she was going to sink. Since all requests to the Japanese had been ignored or refused, Lt Colonel Stewart authorized a small party to attempt to break out, principally to persuade the Japanese to at least give them a fighting chance. Lt H.M. Howell had survived two previous shipwrecks, and so was put in charge of attempting to open the hatch. One of the men produced a butchers knife which had not been detected by the Japanese, and Howell climbed the steel ladder in pitch darkness to attempt to cut an opening. Trying to hang on with one hand, while thrusting the knife with the other was too much and Howell gave up due to lack of oxygen. At 08:10 on the 2nd October, Captain Shigeru sent a flag message to the "Toyokuni Maru" requesting permission for "all" to abandon ship. The reply was that a ship would come alongside and take off the Japanese guards, and crew, but not the P.O.Ws. At 09:00 the ship gave a heavy lurch, and Howell who had found a rickety wooden stair leading up to the hatch, tried again, this time succeeding. Lt Howell and Lt Potter plus one or two others climbed onto the deck, reporting that they could see an Island. They saw some gunners trying to get through the portholes from number three hold onto the well-deck. Howell and Potter unscrewed a bulkhead door and let them out. They then walked slowly toward the bridge asking to be allowed to talk to the captain of the ship.The Japanese opened fire with their rifles into the hold, killing one man, and wounding Lieut G.C. Hamilton. They fired again, hitting Lt Potter and one or two other ranks who had climbed onto the deck, Lt Potter subsequently died. The remaining men returned to the hold and reported to Colonel Stewart that the ship was very low in the water and evidently about to sink. Suddenly the ship lurched again, and began sinking by the stern, the water rushing into the now open hold. The stern resting on a sand bank and the forward section remained protruding from the water for about an hour. Colonel Stewart gave the order to abandon ship. The Japanese soldiers and sailors who were standing by aboard ships alongside, now began to fire at the escaping prisoners, and at those swimming in the water. About three miles away there were some small islands [Sing Pan Islands] which were believed to be very rocky and dangerous, and the current was swiftly taking men in this direction. About four Japanese ships were standing by, but made no attempt to assist the prisoners. Ropes were dangled from the ships, and as prisoners tried to climb them they were allowed to get within inches of the deck, and were then kicked back over the side. Later the Japanese policy changed, but not before several men had managed to get to the islands, many were lost however in the water or sent crashing onto the rocks. Others were picked up by Chinese junks and Sampans and taken to the islands. These Chinese treated the prisoners with great kindness, giving them what little food they had and some of their clothing. Then the Japanese landing parties came, and gathering the prisoners together they transferred them to Shanghai. Others were taken aboard Japanese craft, or put down the holds of other ships. Most of those recovered were naked and covered in oil. The night air was so cold that the prisoners sheltered under the tarpaulin. From then on they received four hard tack biscuits a day with some watered down milk and every third day a bowl of thin weak soup. On the 5th October all the prisoners who had been recaptured were assembled on the dock at Shanghai and a roll call was taken, of the original 1816 prisoners 970 answered their names, 846 had perished. It was learned later that six or seven men had managed to escape, assisted by the Chinese. Thirty five of the worst dysentery patients were left in Shanghai and the remainder were taken aboard the SS Shinsei Maru, where five men later died. On arrival at Moji en-rout for Osaka fifty more very sick prisoners were dropped off at Kokura with a similar number at Hiroshima. Five hundred went on to Kobe and the remainder to Osaka. 200 died during the first winter from diphtheria, diarrhea, pneumonia, and malnutrition. It had been the intention of the Japanese to let the prisoners all drown , so that they would be able to say that the ship had been sunk by the Americans, leaving them no chance to effect a rescue. It was only after the Japanese had watched the Chinese rescuing so many prisoners that it was decided that their original plan would not be believed. All the prisoners could have been saved, had the Japanese transferred them at the same time they had transferred their own troops.. The Lisbon Maru was not marked in any way to indicate that she was carrying prisoners of war, which in itself was a contravention of the Geneva agreement. For the families of those men who went aboard the Lisbon Maru on the 25th September, no one will know exactly which men drowned and which managed to survive to die later, the Japanese did not keep records.